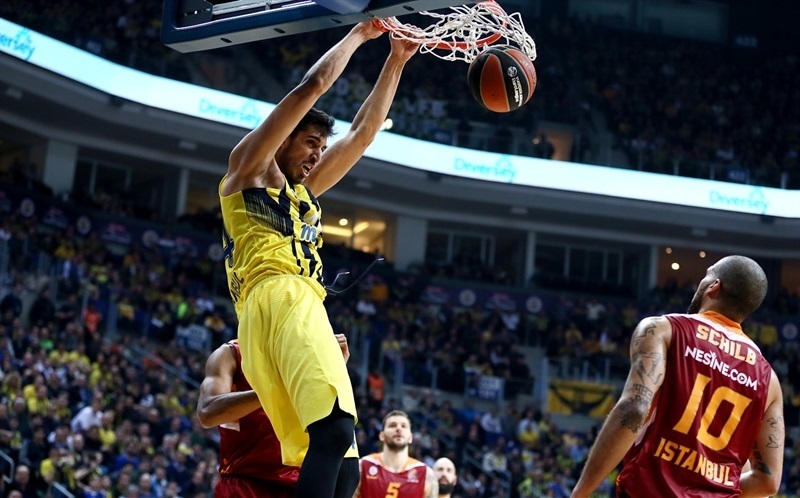 Fenerbahce Istanbul rallied from a 15-point third-quarter deficit to defeat rival Galatasaray Odeabank Istanbul 85-80 in the big Istanbul derby on Thursday at Fenerbahce Ulker Sports Arena. 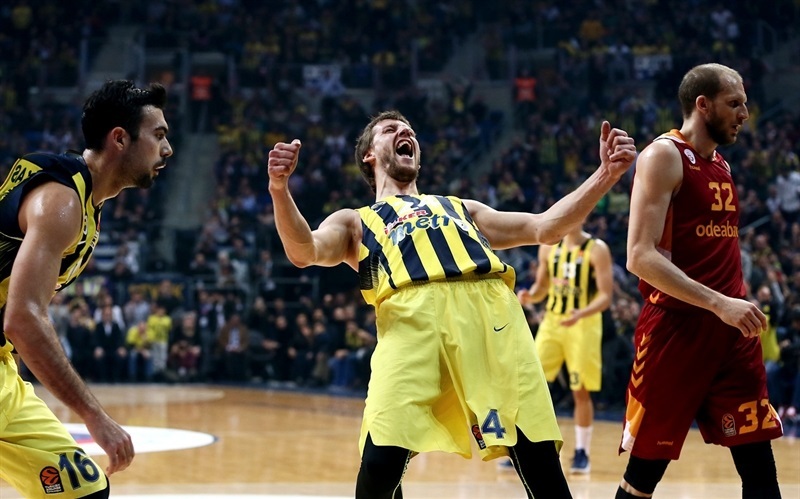 Fenerbahce recorded its third straight win to improve to 13-7 and remain among the top four in the standings, while Galatasaray fell to 6-14 and last place. 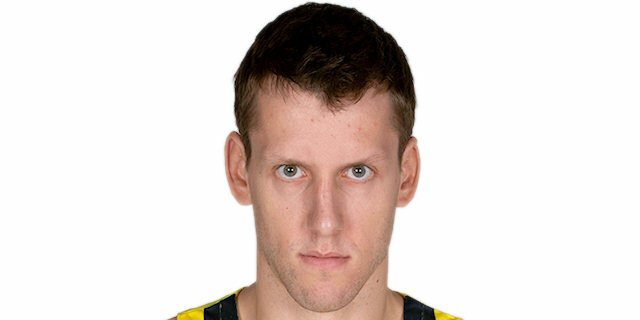 With All-EuroLeague center Ekpe Udoh sidelined, Fenerbahce saw another All-EuroLeague big man step up; Jan Vesely dominated with 20 points on 8-of-9 shooting plus 7 rebounds to lead the winners. 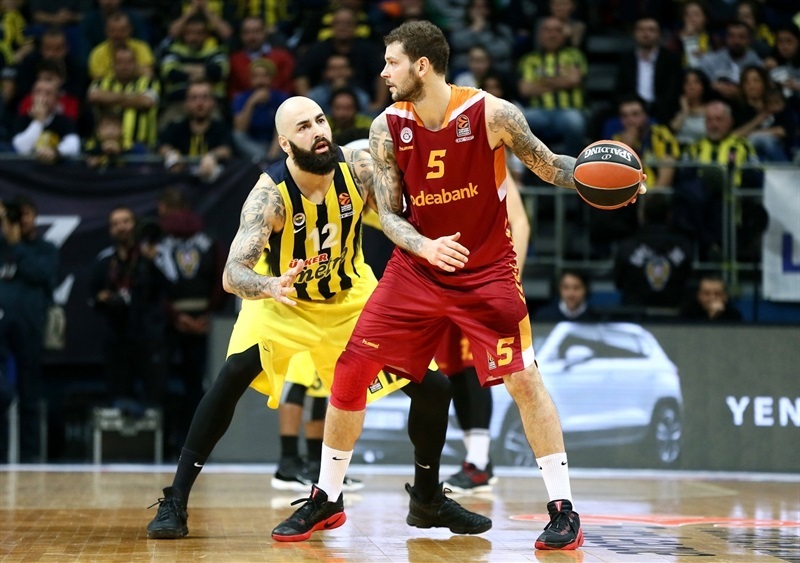 Bobby Dixon added 17 points – including the go-ahead three-pointer, Luigi Datome posted 14 points and 6 rebounds and Bogdan Bogdanovic also scored 14. 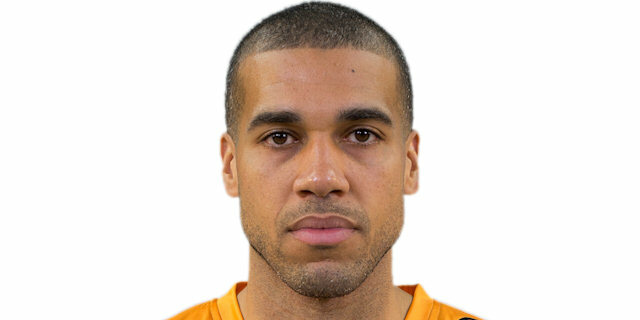 Blake Schilb paced Galatasray with 21 points and 7 assists, Sinan Guler tallied 17 and 8 and Vladimir Micov scored 14 in defeat. 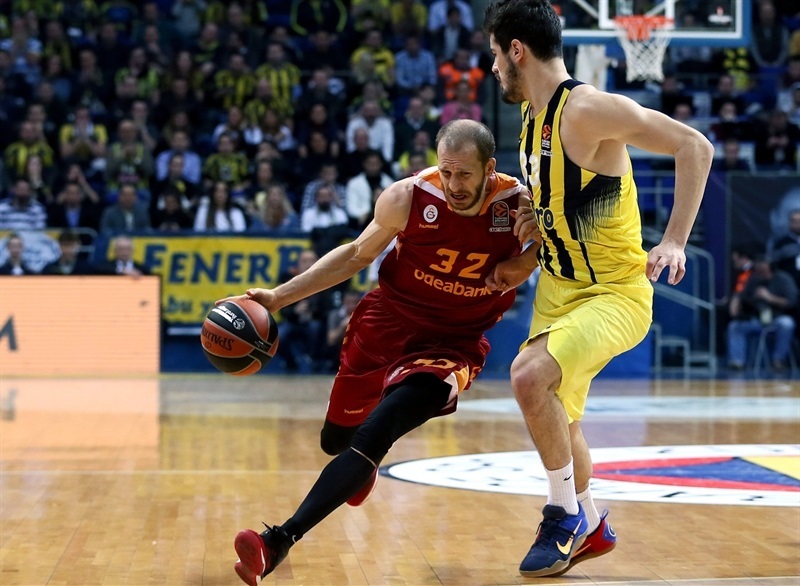 The Galatasaray guards started strong as Bruno Fitipaldo and Guler each had a three and 5 points in a 5-10 start. 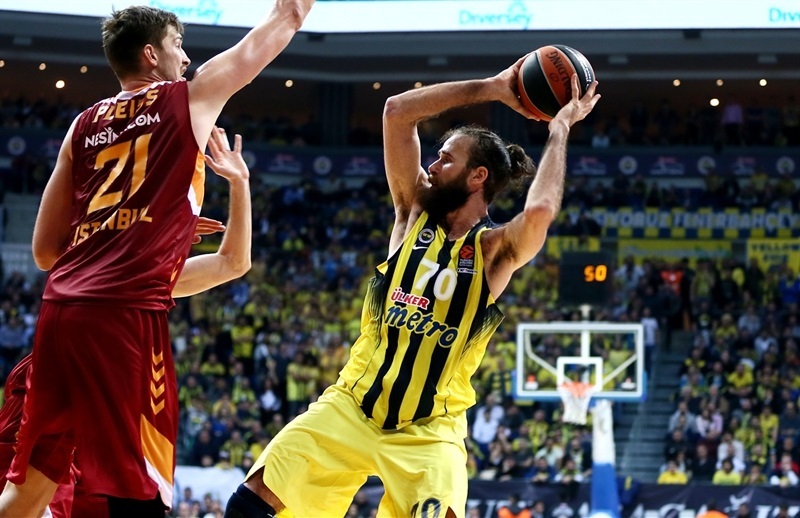 Datome jumpers and Vesely slams helped the hosts close the gap, but Guler’s steal was followed by back-to-back threes by Micov and Guler to make it 11-22. After a Fenerbahce timeout, Bogdanovic started to heat up, but Schilb connected from downtown to keep the visitors on top 19-27 after 10 minutes. 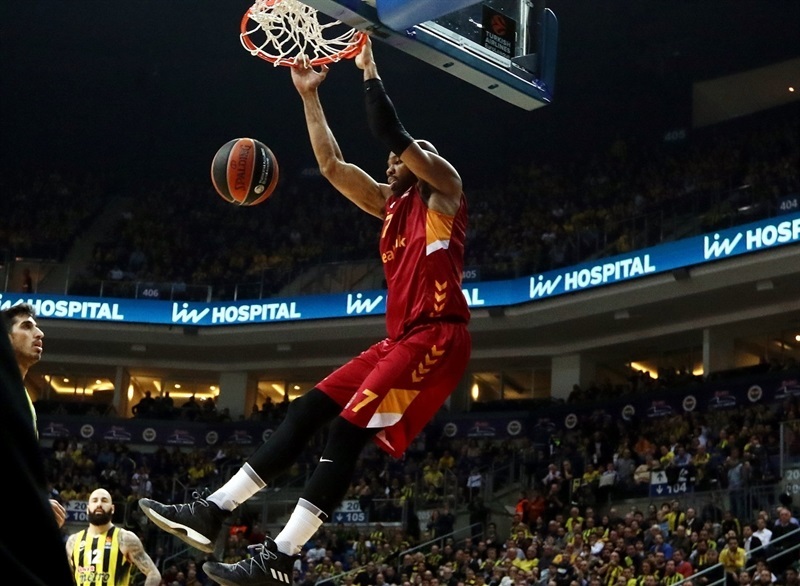 Ahmet Duverioglu took charge with three dunks for Fenerbahce, but Schilb was just as effective for Galatasaray with a spin move and layup and a trio of assists to keep his team comfortably ahead. A pair of Schilb jumpers pushed the margin to 31-45. 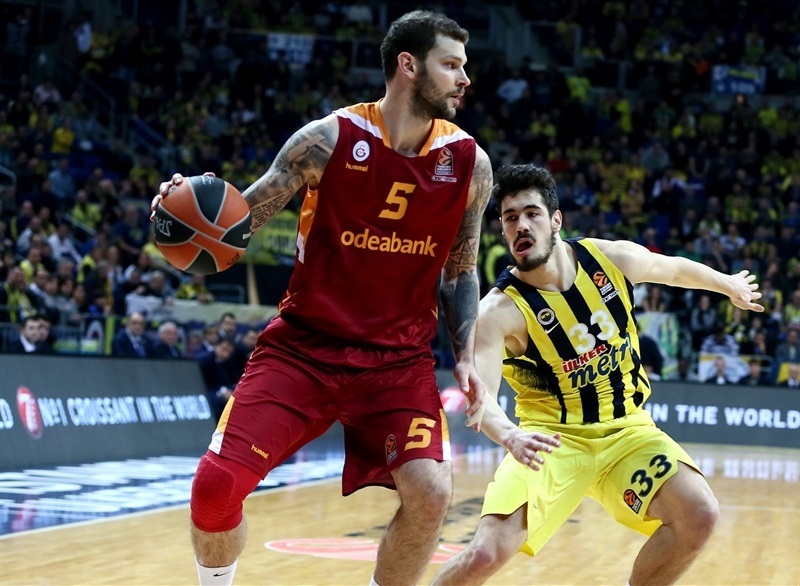 Threes by Datome and Dixon got the crowd involved, however a three-point play by Tibor Pleiss and another Micov triple gave Galatasaray a 14-point advantage. The difference was 15 before Bogdanovic banked in a shot to make it 41-54 at the break. Guler remained hot for the start of the second half, but a determined Dixon helped narrow the gap to 51-61. 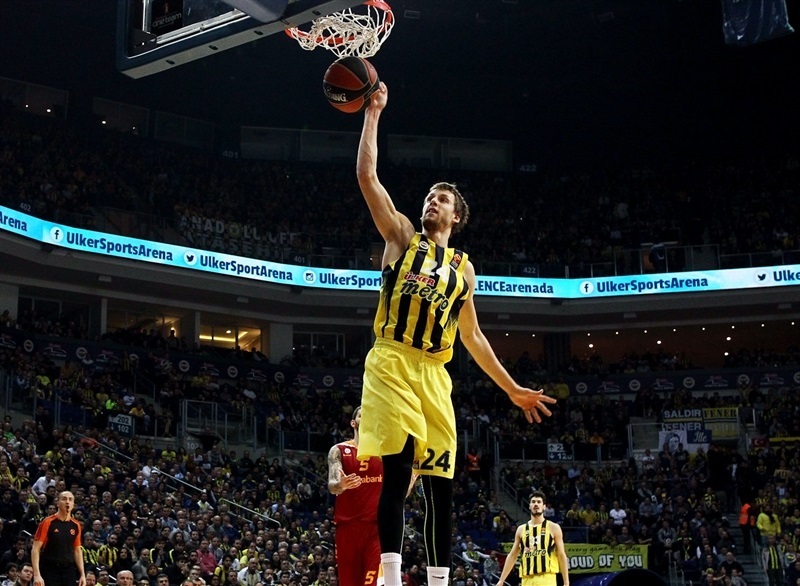 Kostas Sloukas assisted on Vesely’s alley-oop slam and then penetrated for a layup. Vesely’s tip-in closed the gap to 57-63. The Fenerbahce big man added a block and another put-back before Dixon hit a tough three to all but complete the comeback at 64-65. Alex Tyus spit free throws to end the third quarter at 64-66. 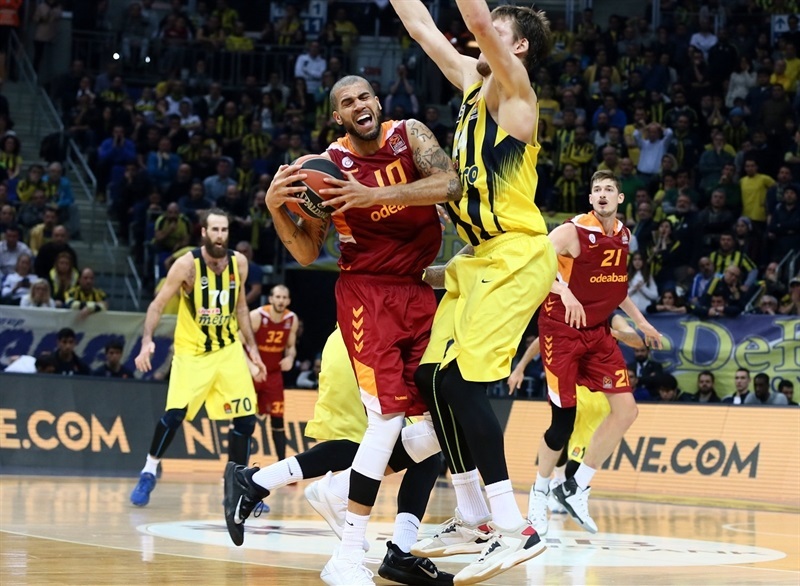 Galatasaray rebuilt its lead on a Schilb jumper and Jon Diebler triple to make it 66-73, however a Nunnally three and a Datome layup evened the score at 73-73 with five minutes to go. After a timeout, Schilb drilled a timeout, but the hosts kept the pressure on and Sloukas’s layup gave Fenerbahce its first lead, 77-76, since the opening minute. The lead changed hands on a Pleiss put-back and Vesely layup. Then Micov free throws made it 79-80 with 50 seconds left. Dixon drilled a clutch triple, Vesely drew an offensive foul from Micov and Datome hit 2 free throws to make it a two-possession game with 22.2 seconds remaining. 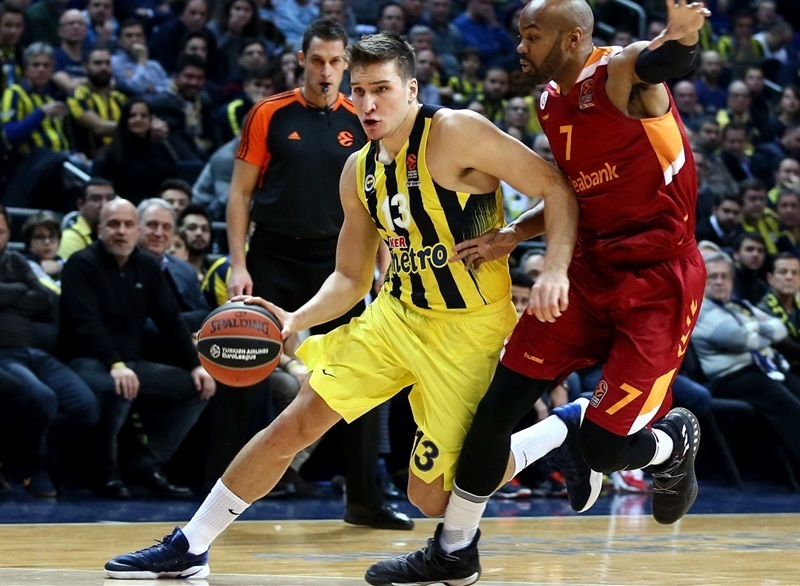 Nunnally rejected Diebler’s three-point attempt and Bogdanovic iced the game from the line. "It was a tough and difficult game. After the game in Kazan and the long trip, getting back here at 6 in the morning, it was not easy. And we played against a team that two days ago played an excellent game against Maccabi. And they had a lot of confidence and played a really good game tonight, so congratulations to them. We played two different halves. In the first half, everything for them was easy; easy baskets under the baskets, open shots, 18 assists, so this means that our defense was really bad. 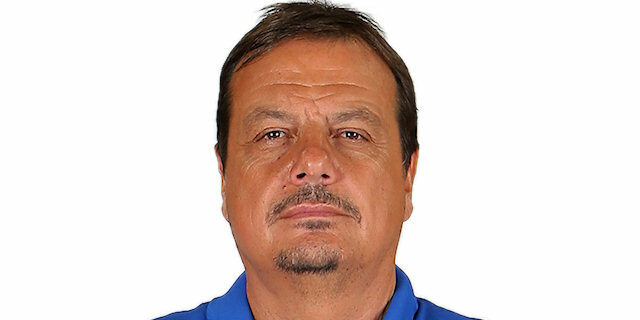 A lot of misunderstanding in our defense and because of this everything for Galatasaray was easy. And they scored almost everything. We changed in the second half; you can see in the numbers: in the first two quarters, 27, 27. Third and fourth, 12 and 14, so 26 total. So this was absolutely the key to the game. We came to the situation where we had the chance to win the game. After the timeout, Bobby scored a three that was a very typical shot for him. After that, a defensive stop was enough to win the game tonight. Before that was an excellent job by all the players in the second half. Congratulations to my players who showed character in a very difficult moment. " 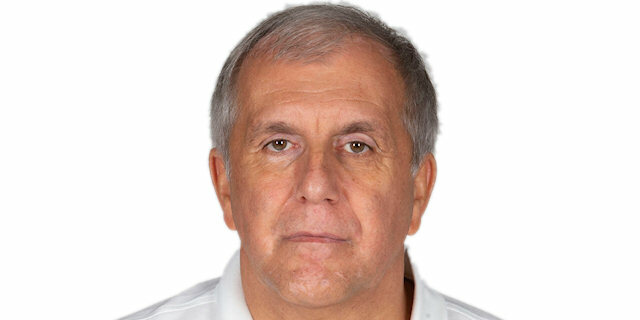 "We have been playing great basketball recently. I believe we played great basketball tonight as well in a very difficult atmosphere. 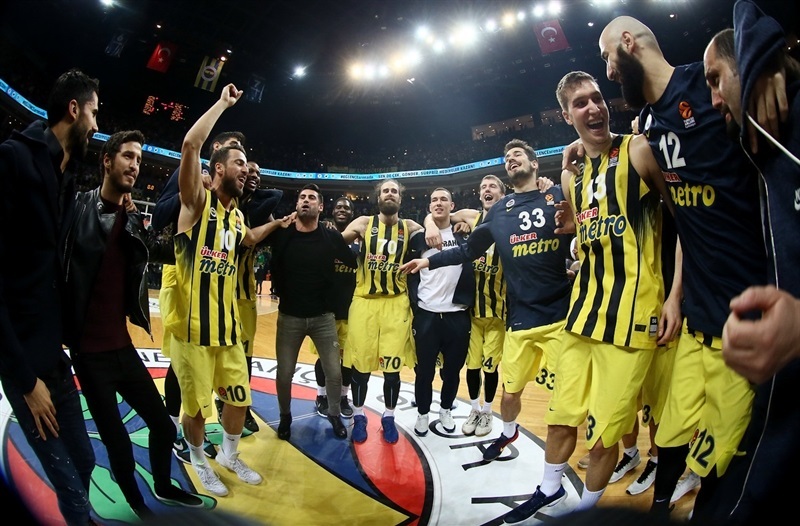 Fenerbahce is one of Europe’s strongest teams. It’s an away game as well as a derby. We were in form and very concentrated and played excellent basketball in the first half. We played at Ulker Arena like we did two days ago on our home court against Maccabi. 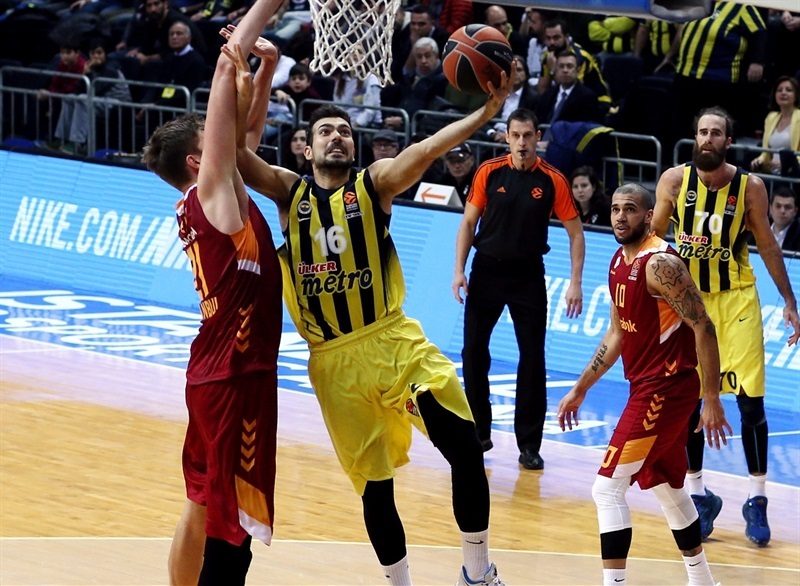 In the second half Fenerbahce started to play more aggressively, put pressure on us and this led us to make turnovers. We started losing control of the game and got into foul problems and started going down in the game. With this we had problems on offense, but we were still okay on defense, although they scored many points. We brought the game to the last ball, until we got to that point we has some early shots. We tried to finish the game early with three-pointers and tried to finish the game in the last two, three minutes. Bobby Dixon made his classic three-point shot through a pick-and-roll and we made a mistake on defense and Tibor Pleiss was very tired, so we couldn’t make the necessary screen on defense. Bobby scored his three-pointer and we lost the game. " "We played a terrible first half. We started the game without defense. We thought it was going to be easy, but they are a good team and the EuroLeague is not easy this year, so we had to play from the beginning. We did it in the second half. It was a team win. I tried to do my job. Ekpe is out, so someone had to step up. He was doing a great job until now with the injury. " "I thought we played an excellent game, actually. In the first and second quarters, we were moving the ball. We had Fenerbahce on their heels. We were getting the shots we wanted and the stops on defense in the second half, especially in the fourth quarter. We started making more difficult plays and we weren’t getting those easy shots any more. And then they made some big shots. It was a close game. "